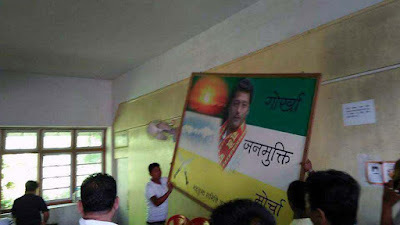 A number of Gorkha Janmukti Morcha (GJM) banners with the picture of GJM supremo Bimal Gurung were on Saturday removed from a party office in West Bengal's Kalimpong district during the celebration of the party's 11th foundation day, sources said. According to sources close to GJM, a section of Gorkha Janamukti Morcha activists in Kalimpong district's Damber Chowk party office, removed all the party banners and placards with Gurung's picture on it, ahead of the celebrations. The celebrations across the hills were themselves cut short amid confusion over the party leadership, a GJM leader said. The GJM, that that has been spearheading the revived movement of Gorkhaland in the northern West Bengal hills in the recent months, is facing "heightened internal differences and confusion" as a section of activists remain with Gurung while another faction has shifted allegiance to expelled party leader Binay Tamang, a party leader said. "There is massive confusion among the people in the hills now as there are two groups within the party. One still supports Bimal while the other is with Binay. As a result, the foundation day programmes this year have been very brief as compared to the previous years. The celebration is not as jovial as it used to be before," GJM leader Kalyan Dewan told IANS. "It is unfortunate that there is a struggle between the two factions in the party. Everyone has the democratic right to support a party or an individual, but that has to be observed in a democratic and peaceful manner," he said. Both Tamang and Anit Thapa, who were expelled by GJM chief Gurung following a dispute over the withdrawal the shutdown, were present in the party's foundation day programs in their respective localities. About Tamang's position in the party, Dewan said no one in the hills wishes to get disassociated from the GJM as that would make them irrelevant in the hill politics. "Though Tamang has been made the chairman of Board of Administrators in the hills by the Bengal government, he is keen to be part of the GJM claiming that his expulsion was unofficial and improper. No one wants to get disassociated from GJM here," he said.